Since the foundation in 1994 of Amadeus Travel, a specialist Costa Rican Travel Agency we have endeavoured to promote sustainable and lasting tourism in this country. As a Travel operator we see our responsibility in working in fair collaboration with the local tourist businesses and in supporting carefully chosen projects that are meaningful both socially and ecologically. A part of our income is donated to the exemplary project „rain forest of the Austrians“ in the Esquinas rain forest. With a visit to the reservation of the Maleku-Indigenas, we enable our clients to encounter the original culture, the income from such tourism helps to improve the standard of living. The basic idea is not only the protection of nature but also the indigenous Costa Rican’s “give something back“ The rural tourism connects these two goals with tours to native farms, crafts enterprises, indigenous Indians and worthy native projects. Sustainable tourism is able to create jobs and incomes, integrate and promote understanding. Agenda 21, agreed in Rio de Janeiro in 1992, and ratified by 179 countries, we therefore strive for a kind of the tourism, that is ecologically responsible and both ethically and socially fair for the local population. The “Agenda 21” as an action program for the 21st Century pursues the goal of securing and improving the basic living standards and providing sustainable development opportunities for current and future generations. Sustainable Development. Costa Rica counts as one of the most interesting countries on the planet and is a major corridor between North and South America. 5% of the Earths Biodiversity can be found in the country. A multitude of endemic fauna and flora shows the multiple layers of the Biodiversity. As a Pacific country with a good social network, Costa Rica stands out amongst other Central American countries. It is for good reasons that scientists from all over the world from early on explore in the tropical forests of the country. Just as with the tourism industry with all its advantages there are also disadvantages for the country and its people. For us, as a Travel Agency, we have a large responsibility for the type of tourism and how it leaves its mark on the country together with its future development in mass tourism market. We fully understand that travel as an important experience and enrich our daily lives. Through the income from tourism, the numerous national parks, biological reservations and other protectorates are thus able to secure the Biodiversity for future generations. As our Agency is located in the capital of Costa Rica and our highly trained team are fluent in German, English and Spanish, you can depend on a competent consultation in the planning of your trip. We put special value on the selection of our tour guide leaders: expert knowledge (History of the country and its people, as well as its fauna and flora) and naturally there communication skills and respect for Costa Rica’s way of life are some of the important selection criteria. 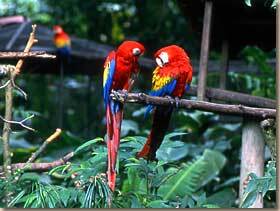 This enables us to offer our customer an unforgettable trip into the nature paradise that is Costa Rica. Our strong points are our individual client consultations and ongoing client care through out the travel experience. We gladly listen and act upon our client’s requests; we are always ready to provide presentations for more exotic trips. The main goal of the Amadeus Travel Agency is the realization of responsible and ecological tourism in Costa Rica. Therefore we support, with a percentage of our income meaningful projects such as the “Rainforest of the Austrians” (Esquinas national park) in order to keep the tropical rainforest alive and to protect it from logging. We all should work together to preserve the forest for future generations! Those who have just once experienced the beauty and diversity of this habitat will hopefully join our philosophy. More over, we want to return something to the people of Costa Rica, in particular to the poorest of the country, so we co-operate with projects that for instance donate clothes. As we are beware of the great biodiversity we also aware of the importance of saving our environment and by supporting sustainable tourism in Costa Rica we want to set an example to others as we strive to reach this goal. The income of the tourism sector should improve the living standard of the country and its people. We are convinced of the fact, that the struggle against poverty is the first and most important step towards a peaceful environment. Ultimately we all want a world, where a happy and satisfied life is possible and the nature has its permanent place. We keep distance from being an Eco-travel-agency, because we cannot duplicate the ecology-thought, as long as we board a plane operated on kerosene. Responsible and ecological tourism is our key word!